Summary for the Busy Executive: Finally, at a loss for words. I don't believe in the concept of greatest anything that you can't judge with measurable criteria: the longest opera, yes; the greatest opera, #So the concept of Greatest Composer Ever in itself rubs me the wrong way. But make no mistake: if you do propose a GCE, you had better make it J.S. Bach, or I'll want to know the reason why you came up with somebody, at first glance, inferior. Berlioz is one of the few major composers uninfluenced by Bach, whose "pupils" include Mozart, Beethoven, Schumann, Mendelssohn, Brahms, Chopin, Debussy, Schoenberg, Stravinsky, Hindemith, Bartók, Bloch, Shostakovich, Vaughan Williams, Gubaidulina, Schnittke, and so on. Who can believe such a legacy? Bach is also the despair of composers, just as Shakespeare is the despair of poets. You sense nothing of strain or struggle or (and this will sound funny) self-conscious artifice in his work, despite the considerable art and craft, and almost everything he wrote is at least twice as good as just about any work you care to name. Beethoven and Mozart sound like children in comparison, Wagner constipated, and Brahms a little dutiful. Furthermore, music poured out of Bach. I forgot how many thick volumes his output takes up, but consider that some scholars estimate about one-third of what he wrote has perished. Every time I want to write about Bach, just as every time I want to write about Shakespeare or Sophocles, I feel even dumber than usual. I long to somehow achieve an epiphany of how he did it and realize of course that this boat will never land. Consequently, I'm slightly in awe of the courage of the participants in this documentary. Baltimore filmmaker Michael Lawrence gets a bunch of very fine musicians (and a couple of critics) to talk about what Bach means to them, both as musicians and in their "civilian" lives. Don't expect startling revelations, but you will get a very strong sense of exactly how big a deal Bach's music has become for some of the best performers of our time – a star-studded cast, in fact. I have no idea how he persuaded so many from the current A-list to appear. Furthermore, many of them perform complete pieces on the bonus disc. Joshua Bell plays the Chaconne. Hilary Hahn, unfortunately, plays only a snippet from one of the solo violin movements. Richard Stoltzman does an extraordinary job with just his clarinet on the Chromatic Fantasy for keyboard. When asked what he thought he could bring to the piece to make up for the necessary loss of parts, he replied, "I can give it breath." He does just that. Other musical highlights include a terrific young organist, Felix Hell and the Swingle Singers (led by their founder, Ward Swingle) in an a cappella "Badinerie" from the second orchestral suite. Jake Shimabukuro plays the 2-Part Invention #4 on the ukulele, and the spectacular bluegrass mandolinist Chris Thile goes to town on the Prelude from the Violin Partita #3 (a lively, danceable account – I wish violinists would play it that way). Finally, guitarist Manuel Barrueco delivers an astonishing fugue from the Violin Sonata #1 as if it posed no fingerboard problems whatsoever. You quickly stop waiting for him to stumble or hesitate and give yourself to the music. As for the interviews, Philip Glass says nothing particularly interesting, at least not to me. 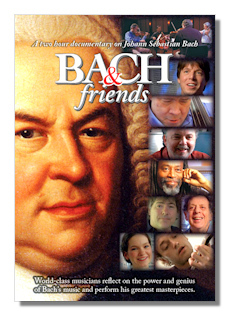 Peter Schickele maintains the PDQ Bach fiction. Several people talk of improvisation as the basis of Bach's art. In a sense, it's probably true, since most composers begin that way. In Bach's case, however, it doesn't really account for the immense craft that he seemed to hold literally in his fingers as well as in his head. Bach had the ability to understand almost at once the contrapuntal possibilities of a theme. His son, Carl Philipp Emanuel, relates the story of the two of them attending an organ recital and the old man predicting the course of the fugal improvisation and nudging him when each prediction proved correct. It's not just improvisation, but an ability and a facility ultimately beyond our ken. It's effortless, because that's the only way it can happen at all. John Bayless contributes a couple of improvisations. Though Bayless plays well, you wouldn't mistake his products for Bach, even if Bach had an off-day and wore mittens. For me, the two most interesting sequences come from pianists João Carlos Martins and Hilda Huang. Martins, a tremendous virtuoso in his youth who recorded an exciting account of the Well-Tempered Clavier, lost the pianistic use of both hands. In his interview segment, he plays the Largo from the Concerto in f almost like two-finger typing, and very beautifully. He tells the story of Bach's month in jail (Bach wanted to break his contract with his current noble employer), during which the composer began to write the WTC. This turn of adversity to something productive (and how!) became a source of inspiration to Martins. When he lost the use of his right hand, he told himself that he could play the left-hand repertoire alone. When he lost his left hand, he despaired, but eventually realized he could conduct. "Bach kept me alive." Hilda Huang (still with braces on her teeth) gives a surprisingly mature account of a Contrapunctus from Art of Fugue and talks of how Bach's music is more "internalized" than when she plays other composers and how, performing Bach at senior centers, she thinks of "rejuvenation and freshness." This from a twelve-year-old! The DVD set currently is available only from the filmmaker. He plans eventually to put this in wider distribution, like at Amazon. However, plans, as we know, gang aft agley. If this CD interests you, hit the web site (see above) and pony up $39.95 for the two discs. Copyright © 2010 by Steve Schwartz.